The Fire Behavior Field Reference Guide (FBFRG) describes a range of practices by which fire behavior assessments are conducted for fireline leadership in the field, and by Fire Behavior Analysts (FBANs) and Long Term Fire Analysts (LTANs) in support of more sophisticated analysis. It is a hands-on publication for use in the field, in fire behavior training, and as a learning reference. It is intended to be used in conjunction with the Fireline Handbook, Appendix B: Fire Behavior, PMS 410-2. 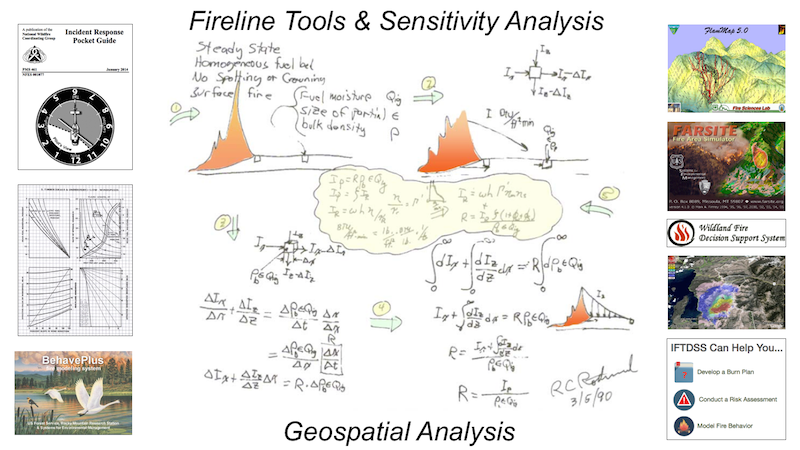 The FBFRG contains helpful references to the factors from the fire triangle (fuels, weather, and topography), including features that are vital to field-going fire managers. It provides detail about the fire behavior models and tools used to estimate fire ignition, spread/size, fireline intensity, and crown fire potential. The reference material will assist with decision support using various tools and methodologies. The guide will be updated twice annually (April and November) as necessary to reflect the most recent science and technologies for field use to help improve and assist with decision support, fireline safety, and fire behavior interpretation. As new and improved safety zone research is obtained and available for distribution, the FBFRG will be updated to house that information. YouTube videos will be uploaded periodically to provide additional supporting documentation: www.youtube.com/user/FireBehaviorSC. The Fire Behavior Field Reference Guide is developed and maintained by the Fire Behavior Subcommittee (FBSC), under the direction of the Fire Environment Committee (FENC), an entity of the National Wildfire Coordinating Group (NWCG). While they may still contain current or useful information, previous editions are obsolete. The user of this information is responsible for confirming that they have the most up-to-date version. NWCG is the sole source for the publication. Comments, questions, and recommendations shall be submitted to the appropriate agency representative assigned to the FBSC. View the complete roster at https://www.nwcg.gov/committees/fire-behavior-subcommittee/roster. The National Wildfire Coordinating Group (NWCG) provides national leadership to enable interoperable wildland fire operations among federal, state, tribal, territorial, and local partners. NWCG operations standards are interagency by design; they are developed with the intent of universal adoption by the member agencies. However, the decision to adopt and utilize them is made independently by the individual member agencies and communicated through their respective directives systems.